When you have a hit single, you have to have a whole bunch of remixes, right? 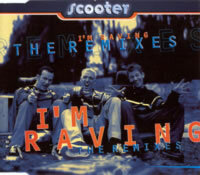 Well, that's the case with I'm Raving, Scooter's 1996 hit which was less-than-loosely based on "Walking In Memphis" by Marc Cohn. Well, without further ado, let's see if any of these remixes can top the original! The Fortunato & Montresor House Remix is exactly what it sounds like: a house remix. At least it uses more of H.P. 's voice, but like the previous remixes, it utilizes very little of the instrumental or melodic parts. The cool TB-303 acid synth from the original comes back in waves, but such glorious moments are fleeting. I do enjoy, in the middle, the sounds of a reversed melody; could this be from the original, only backwards? Either way, it delivers its fair share of funk. Last but not least is the DB 600 Remix; I never expected an "I'm Raving" remix in drum'n'bass style, but here it is. If you're looking for a remix that actually uses the melody and lyrics from the original, you'll find it here, just with more abrasive and occasionally psychadelic bass and big room beats. While it's in no way stellar, there is a certain charm to the simplicity to which the melody is presented with just a mild plucky synth. It's an interesting way to close the remix package. Yet even with this nice little concluding track, I can't say I recommend this remix single. The tracks, aside from being almost TOO far a cry from their source material, are mostly far more lengthy than necessary, offering relatively little in terms of variety in the amount of time they need to get their point across. Pass it up.